Did you know that 48% of projects are not finished within the scheduled time, 43% of the projects are not finished within their original budget and 31% of projects don’t meet the original goals and business intent? Pretty embarrassing data for the project managers, isn’t it? This is according to the PMI Pulse of the Profession annual report. Other researches show an even more apocalyptic picture. According to a KPMG’s recent research, only 31% of all organizations deliver projects that are likely to meet original goals or business objectives. In addition, just 34% of the organizations deliver projects that are likely to achieve stakeholder satisfaction. Poor project managers. Only if they knew there’s a tool that would help them achieve better results. In fact, there is one. Yes, it is Kanban. Interested to see how is this possible? Keep on reading. In short, the Kanban method is a simple in its core, flexible and efficient tool for workflow management. It allows you to organize and manage your process by visualizing every step of your workflow on a visual board called “Kanban board”. In Kanban, there are 4 core principles and 6 practices. This is it in a nutshell. While the concept is unwavering, the structure is flexible, giving you the power of a simple visual management system. Now, let’s see how can you apply Kanban in project management? *Before we continue further remember this, the tasks you create on the Kanban board are called Kanban cards. In short, it helps you visualize your work, so you can acquire a better understanding of your workflow, and organize and manage work more efficiently. It also allows teams to keep track of every project and task with ease. However, it can be applied in different ways depending on the hierarchy level of an organization. Whether you use Kanban on a personal or on a team level, you usually have to deal with multiple projects at the same time. This makes it difficult to track everything because all projects have their own sub-tasks, which multiply the number of work items you need to follow. How a Kanban board can help? You already have your Kanban board and you see how easy it is to track work. So far so good. Now, try to implement a project swimlane on the top of your board. In Kanbanize we call it an initiatives swimlane. This top row serves as the place to break down large pieces of work into tasks and keep track of them. When you break down a given project into smaller tasks, you can link these assignments to the main project. So now, when you want a status update, you can just take a quick overview of the project swimlane and see the current status of each initiative and its sub-tasks. As each of the child cards is linked to the main project, they will appear on the project card as small colorful icons. They indicate in which stage of the workflow the task is. When different teams master Kanban on the team level, they tend to start delivering value faster. However, when all parts of a project start moving faster, it becomes a real challenge to get the bigger picture. If you have more than two teams using Kanban, it is kind of difficult to follow the different components of every project and their current status. How a Kanban board can help here? The Project Portfolio Board is a separate board where you place only huge pieces of work. Naturally, you break down the different projects into smaller child tasks. You put these tasks into the different team boards depending on who is responsible for what, and link them to the mother initiative placed on the Portfolio Board. Now, this may seem a bit confusing, but let’s see it how it actually works. As you can see from the image above, you can visualize work across two or more levels. This ensures that the necessary dependencies between different project components are visualized, which guarantees alignment between the teams. 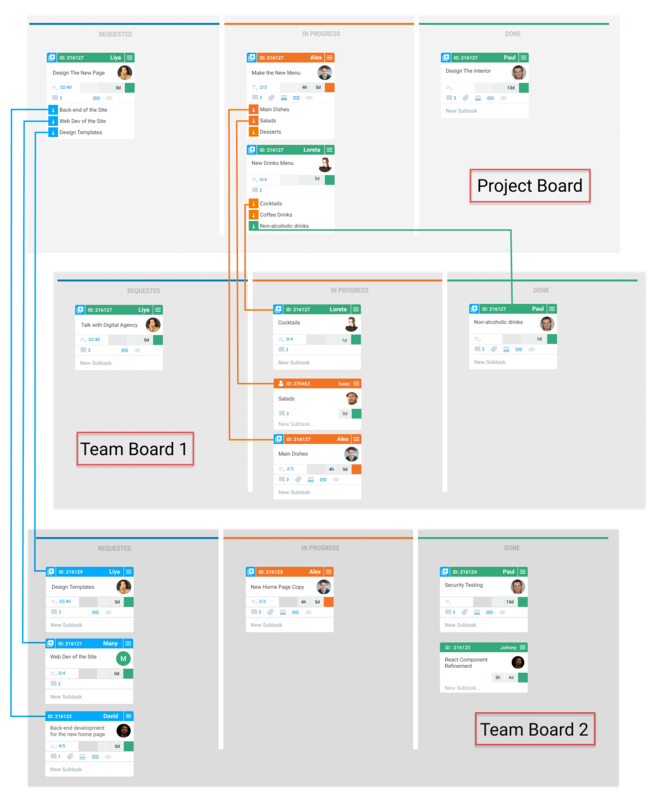 When the project components are visualized on a separate Kanban board, it becomes easy to see which of them have been started or finished with a blink of an eye. At the same time, using the Portfolio board makes it much easier to keep track of every single project running in the company. 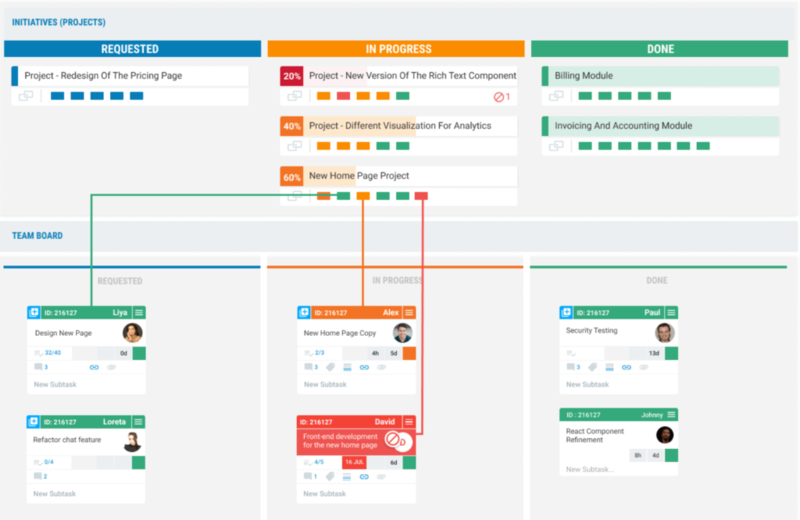 Ultimately, when you break down your project portfolio into projects and then the projects into project components, and then the components into their individual tasks, you will have a Kanban system that covers your entire organization. A lot has been said about planning in the past. One thing is clear, planning is of critical importance if you want to succeed. So how Kanban can help here? 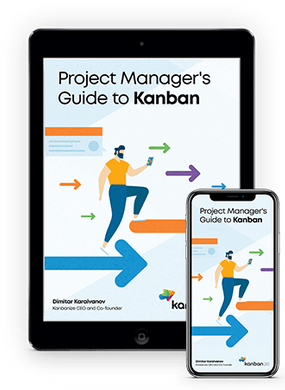 Acknowledging that plans are an essential part of every management method, Kanban offers a lightweight approach to planning. 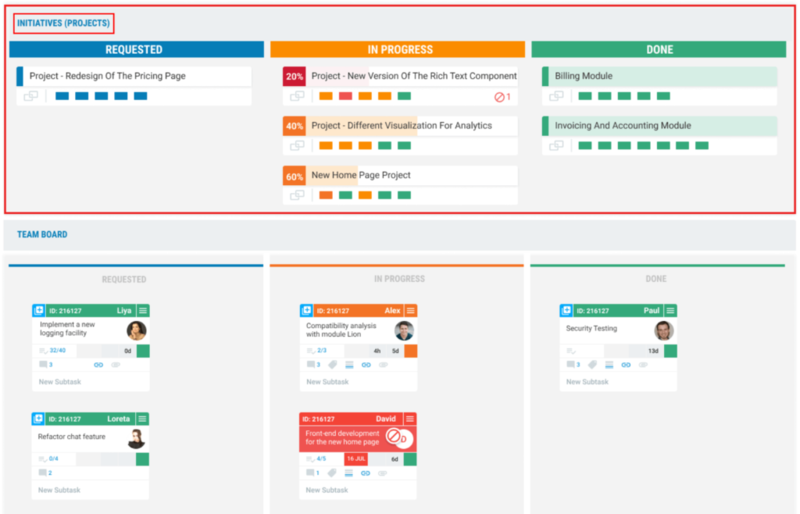 In order to put planning into action, first, you need to have a Kanban project board. This board contains the project components. Focus on the far left part of the board – the Requested area and the Backlog area. They contain projects/tasks that have not been started yet. As shown above, the Requested and the Backlog columns form a reversed timeline – the more you go to the left, the more you go into the future. Putting a work item in the “Q1” column means you plan to complete it by the end of March. This looks like a push system, but what makes it a push system is how you think and act about it. Initially, Kanban is about continuous improvement and the planning should be a flexible process. Update the system regularly so it corresponds to the real world. Don’t try to ignore the influence of the outside world, just for the sake of sticking to a plan. You better use it as a compass. Implementing a pull system is essential for getting the most of the Kanban method. To facilitate the conditions necessary for maintaining pull, you need to avoid assigning (pushing) tasks to your team if more than one person can process them. This way as soon as a teammate with the proper function has the capacity they can start (pull) a new task in progress. A major rule in Kanban – tasks should be ordered by importance. The higher the card on the board, the higher the priority. Simple, isn’t it? Apart from this, you can also use the swimlanes to prioritize work items. For example, you can use swimlanes such as high priority, medium priority, and low priority. In general, the prioritization process in Kanban will assure you that the most important work items at the moment will be completed prior to others. This topic is endless and a paragraph is not enough. 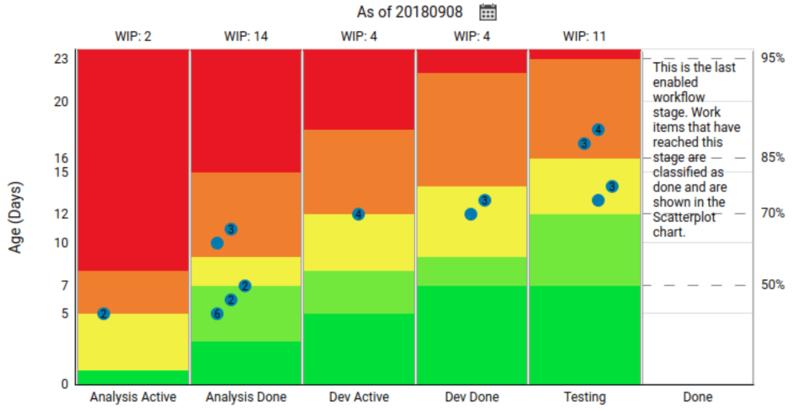 There are different tools and charts you can use in a Kanban software for better tracking and forecasting. These can help you manage the amount of work that is in progress and make sure that you are not overburdening your team. WIP Aging – This chart shows you whether the tasks that are currently in progress are going well or not. It reveals which tasks have greater cycle time and where exactly in the workflow they remain. Your team can focus on these delayed cards and try to get them done before starting new work. This really helps teams avoid starting too much new work, which usually causes a greater amount of delayed work. Monte Carlo Simulations – “When is it going to be done?” – Isn’t this one of the most important questions for project managers? We rarely have the answer. The good news is that Kanban software solutions can solve this problem for you. 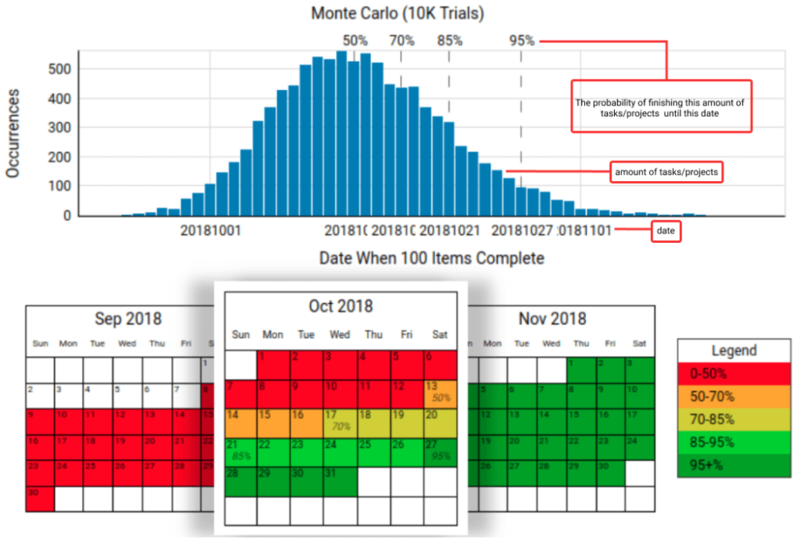 The Monte Carlo simulations are based on the historical data of your workflow. This way, you can see how many tasks you can finish until a certain date and what is the probability of this to happen. Now have in mind that not all Kanban tools are armored with this powerful feature, but if you try one you won’t regret. There is more to be said, but probably a book won’t be enough. If we aroused your interest jump into Kanban and master the way you manage projects. Well, what is Kanban project management about? It’s about finishing work, but not just starting more and more new one. As the Kanban credo states “Stop starting and start finishing”. 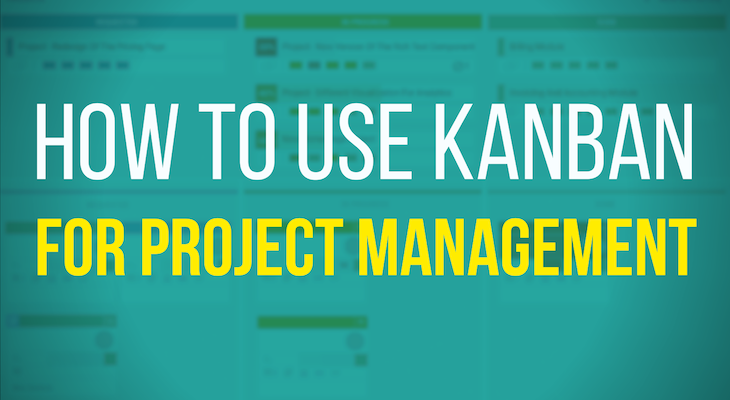 Now when you went through the article you already know some of the main benefits of using Kanban for project management. Do you remember them? Go back at the beginning of the article you will see they are real. 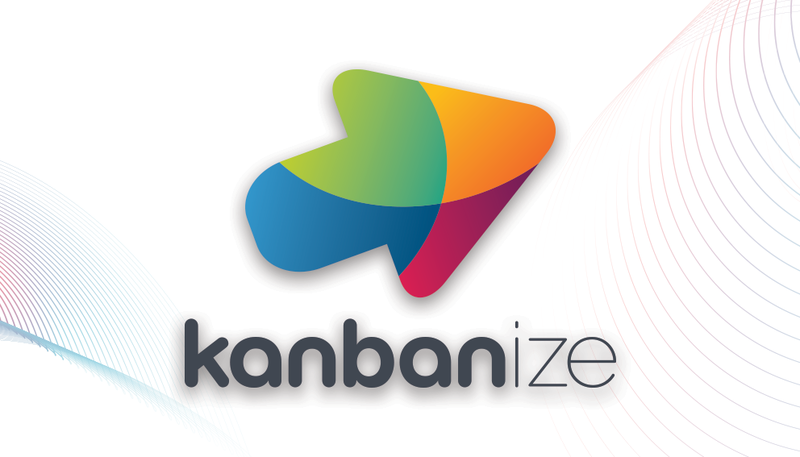 Don’t hesitate to try Kanban. Even if you don’t succeed at first remember, it all about continuous improvement. This entry was posted in Kanban and tagged kanban, kanban management, project management on October 10, 2018 by Pavel Naydenov.